The first RTA conference took place in Dijon, in 1985. This year, 2005, it takes place in Nara. Nara and Dijon share a glorious past but can be considered as being “Sleeping Beauties”, after the title of a book by the Nobel price novelist yasunari Kawabata. Is RTA sleeping on its glorious past? 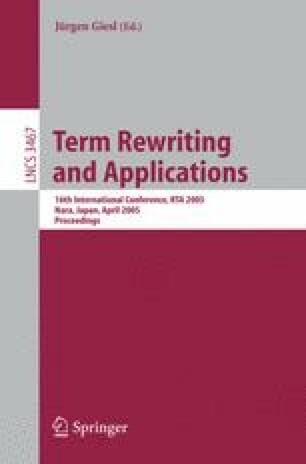 Back in the late 80s, many of us feared that this would soon be the case, that research in rewrite systems was deepening the gap with everyday’s computer science practice, and that we should develop rewrite-based powerful provers that would make a difference with the state of art and help address real applications such as software verification. More than ten years later this has not really happened in the way we thought it would. What has happened is that many research areas, such as programming languages, constraint solving, first-order provers, proof assistants, security theory, and verification have all been fertilized by ideas coming from term rewriting. In return, our field has been renewed by new problems and techniques coming from outside our small community. I am convinced that this will continue, and that new subject areas will join the journey. There are at least two reasons. To quote a celebrated sentence that I have read in many papers: Equations are ubiquitous in computer science. This is the first reason: we all like to use equations for modeling problems. The second is that we have developed extremely powerful, sophisticated tools to reason with equations. Many computer scientists do not know these tools. It is our responsibility to preach for their use by showing all we can do with them. Twenty years later is the title of a novel by the french writer Alexandre Dumas.